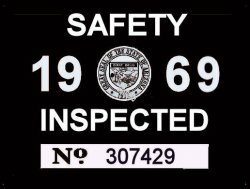 1969 Arizona inspection sticker - $20.00 : Bob Hoyts Classic Inspection Stickers, Add a Final Touch to your Restoration! Arizona had inspections from 1930 to 1971. This 1969 sticker was created from an old beat up original. We took some liberties based on what we have in our collection. Sticker belongs on inside passenger side of your windshield. For an additional $10.00 you can get this sticker with your own license plate number to appear where the serial number is now.